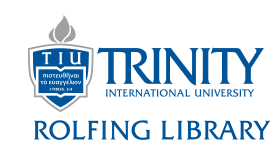 ​ WorldShare is available for current TIU students, staff, and faculty. How long will I have to wait for my requested item to arrive? ​ Each request is different, depending on the availability of the item. Average time from the placing of the request until receiving the item is 4 days for articles and 11 days for books. How will I know when my requested item is available? ​ You will receive an e-mail when the copy or book is available. A PDF copy of articles or chapters will be available in your WorldShare account. Books and other physical items will be available at the circulation desk. Can I renew an item? How? ​ Some books are available to be renewed - it depends on the policy of the lending library. If a book can be renewed, a "Renew" button will appear next to the book in your WorldShare account. Articles and chapter copies cannot be renewed. Are there any items that I cannot request? ​ Textbooks and books on reserve cannot be requested through WorldShare. In addition, while you are welcome to request dissertations, please be aware that sometimes they are not available to borrow from other libraries.